Hello and welcome to the 752nd installment of the SWD. A work machine belonging to Turkish-backed jihadist groups and trying to destroy houses of civilians and the school of village was targeted by our fighters in village of Jalber of Afrin’s Sherawa district. A terrorist in the vehicle was killed and the vehicle was destroyed. Our fighters carried out another operation against a base of Turkish-backed Sultan Murad terrorists in the same area on the same day. 3 terrorists were killed and 7 others wounded in the operation. Improvised explosive device wounded two elements of the Syrian Democratic Forces in the city of Raqqa. The wounded elements were transferred to a military health center in Al-Rumaila neighborhood. Syrian Arab Army’s artillery shelled Al-Khuwayn, Saraqib, Maarat al-Numaan, Al-Nairab, Kafroumah (Kafr Rumah), Kafr Ayn, and Al-Qassabiyah. According to the Syrian Civil Defense (The White Helmets), eight civilians were killed and 35 were wounded by the shelling of Saraqib and Al-Nairab. Reports also stated that one of the shells targeted a building of Saraqib’s local council, killing two staff members of the council. Unknown gunmen opened fire on a Syrian Arab Army’s post in the city of Al-Musayfirah in eastern Daraa. The incident occurred several hours after the Syrian Arab Army raided a house belonging to a former commander of the Free Syrian Army, Mohammed al-Bayoumi. Al-Bayoumi previously signed an agreement with the Syrian government and was evacuated from Daraa towards greater Idlib region. 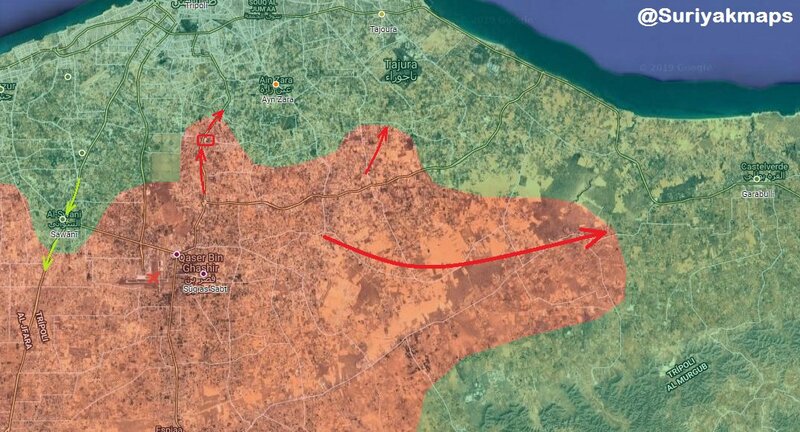 Libyan National Army made further advances towards Tripoli from Qasr bin Ghashir towards outskirts of Khallet al-Furjan district. The army also foiled a counterattack of the Government of National Accord’s forces on the Tripoli International Airport. Government of National Accord’s Ministry of Health stated that 21 individuals were killed and 27 were wounded in Tripoli clashes during the past four days. Government of National Accord’s spokesman of its armed forces announced the launch of Burkan al-Ghadab (Volcano of Anger) operation against the Libyan National Army. The operation aims at capturing all of Libyan cities from the Libyan National Army. Two elements of the Afghan Local Police surrendered to the Islamic Emirate of Afghanistan (Taliban) in Ghalmin area of Firuzkoh district. Islamic Emirate of Afghanistan killed two elements of the Afghan National Army in an attack on a post in Qarabagh district. Islamic Emirate of Afghanistan attacked an Afghan National Security Forces’ convoy on its way towards Urozgan province in Ordu Balagh area of Shah Wali Kot district. Ten elements of the Afghan National Security Forces were reportedly killed in the attack.